The night before, I lost my temper. I felt so helpless and useless. My daughter made a big fuss before she slept. I lost my control. I ran out of ideas how to talk to her in a friendly manner so that she could listen to me and lie down. On the other hand, I was worried if I was not stern enough, soon there would be another spoiled child in this world. I felt so bad and guilty for losing my cool and the punishment I imposed on my daughter. I got to do something to improve my poor parenting skills. Gracious me, after flipping through, I realized that the book was indeed superb. And I have to tell you, at that moment, I had no clue at all about the book and the two lovely authors even though the book was a hit and written more than 20 years ago. Did I make the right choice picking up the book? You betcha. To say the least, the book changed my life. The book turned me from an easily agitated father to a friendly one. The book helped me to improve my relationship with my daughter. Only after reading the book, I come to realize that communicating with kids is no different than communicating with adults. You use the same psychological approach. In short, you treat a kid just like how you treat an adult. Or just like the way you want to be treated. What’s the title of the book? It’s How To Talk So Kids Will Listen And Listen So Kids Will Talk. Let’s get down to the book. The book has been revised and updated many times to keep up with changes since its first publication in 1980. In the book, authors Adele Faber and Elaine Mazlish wrote down their own experiences as well as experiences of students of their parenting workshops. This is what makes the book special. The book is not a bunch of theories but it’s full of real life stories encountered by real parents. Adele and Elaine shared tips on how to tackle each and every one of the challenges in the book. Every chapter starts with a question that was asked to parents in the authors’ parenting workshop. You’ll be asked to do an exercise on how to deal with the given situation. Sometimes, parents would role-play in order to appreciate the issue better. Role-playing offers an opportunity to parents to write down how they approach a certain situation at home or to let them see and feel from a child’s perspective. After which, the authors would show you the effective way to handle a particular situation and the reason behind it. Let’s say your son comes home and shows you a drawing he did in school. What do you say? What a lovely picture? The authors pointed out that when you praise your child, you need to describe what you see or what you feel. Another excellent point when you face a problem with your child, the suggestion is to sit down with your child and brainstorm a list of possible solutions. Your child’s voice is heard and he feels respected. What more when you write down the solutions on paper. Each chapter has cartoons to illustrate the main points. The cartoons are not fantastic but they serve the purpose. I use these cartoons as a quick reference. Apart from discussing the main point of the chapter, which forms Section I, the authors have put in Section II called “Comments, Questions and Parents’ Stories.” Questions raised by parents, letters from parents and feedback from parents can be found in this Section. What I learned most from the book is how to be an empathetic parent by understanding how a child feels. This technique alone helps reduce resistance from the child and the result is he tends to accept what you say more openly. I find that this book contains timeless human communication principles that had worked in the past and will definitely work 100 years from now. The gist of the book is to communicate with your kids with love, respect and empathy so that they will listen to you and do what you want of them. It shows you the importance of taking your child’s inner feelings into consideration when you deal with him. For this reason, it’s not surprise to find out that time-out is not recommended in this book. By applying what you learn from the book, you’ll raise a child who is open, well behaved, honest and emotionally mature. That’s not all. 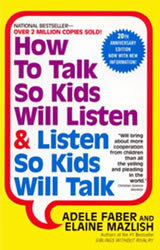 If parents talk to kids in a manner described in this book, your kids will pick up from you. They will learn how to communicate effectively with others – in school or later in workplace. These are essential skills of a successful kid. Judging from my comments here, you’ll know, without a doubt, I highly recommend this book to every parent and even grandparent. Even until now, I still flip through the book to help me get back on the right communication track as my old-fashioned ways of talking to my kids (unfortunately they are mostly wrong) are so ingrained in my mind that they come up so easily. If you are having problems talking to your kid, or your kid will just never listen to you, or do what you want, get this book and read it from cover to cover. I have prepared a mind map for How To Talk So Kids Will Listen, you can download here (right click and choose “Save Target As…”). The PDF mind map contains all the main points of every chapter. I recommend you print it out and refer to it whenever you need ideas to communicate effectively with your kid. If you want to own a copy of the book (which I highly recommend), it is available from Amazon. Visit and find out why the book is rated 4.5 stars (5 stars being the highest) by 149 readers. Hint: 79% gave 5 stars rating to this book! Read customer reviews here.